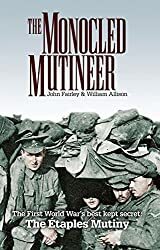 When I was asked if I would read and review a revised edition of The Monocled Mutineer by John Fairley and William Allison, the book on which the 1986 BBC TV series was based I was immediately interested as I had watched the TV series. In 1917 British, New Zealand and Australian troops stationed at the Ã‰taples Training Camp in northern France protested against the inhuman conditions and the protest erupted into mutiny. Private Percy Toplis was named by the authorities as a leader of this mutiny. While several of the mutineers were executed in its aftermath, Toplis escaped and remained at large for three years. The Army immediately covered up the mutiny, thousands of the participants died shortly afterwards in the Passchendaele offensive while the survivors remained silent for over fifty years. After three years as Britain’s most wanted man Percy Toplis was killed in 1920 by a policeman. In addition to the anecdotal evidence the authors have used other sources including the published personal reminiscences of Edwin Woodhall, Detective and Service Days and Lady Angela Forbes. Memories and Base Details; journalists’ accounts in various periodicals; and have drawn background material from records about the First World War in the Imperial War Museum, The Public Record Office and the British Newspaper Library. But in 1978, after the publication of the 1st edition and the BBC dramatisation, the British government admitted that the events that took place at Ã‰taples had been a mutiny and also that it was probable that the records relating to the board of inquiry into the events had been destroyed many years ago. The files on the mutiny and Percy Toplis’ military records are closed until 2017. Historical accuracy is never easy to obtain, especially where records have been lost and where there is a limited number of sources to compare one against the other. In this case the main sources of information are the personal accounts from the veterans as they remembered them many years later. Another reported that Toplis, heading a mob of about 1,000 deserters confronted Thompson, surrounding his car. Toplis climbed on the running board and dictated the terms for ending the mutiny (page 93). After the mutiny ended, whilst some of the ringleaders were executed, Toplis escaped. Others were killed in the battle for Passchendale which began on 20th September. Maybe more information will be available in 2017 when the files are opened and a fuller picture of what happened will emerge. The Monocled Mutineer also goes into detail about Percy Toplis’ life before and after the war. Coming from a working-class background, by the age of eleven he was already a con artist and a thief. He must have been a charismatic character, able to both charm and deceive people, successfully impersonating officers, able to melt into the background deserting and then rejoining the army seemingly at will, not sentenced to execution by the firing squad (the penalty for desertion). But after the war ended in 1920 his luck ran out as he was accused of murdering a taxi-driver. The inquest held that he was guilty in his absence. Toplis fled, evading capture for six weeks and he was eventually shot down in a police ambush near Plumpton in Cumberland. Sounds fascinating! I remember the title from the BBC adaptation, which I really thought I had watched. But having read your review I now realise I couldn’t have since the story is completely unfamiliar to me. I wonder if it’s available on DVD – must check! This sounds absolutely fascinating, Margaret! I’m so glad you had the opportunity to read that updated version. This is the sort of history that doesn’t always get ‘press,’ so it’s good to know that someone’s been compiling all of this new information.